In the Orthodox spiritual tradition and in the Bible the heart is the center and core of our being, and there’s a lot of biological information that backs this up. In the human fetus the cardiovascular system is the first to form and there are beating cardiac cells within the fetus twenty-one days after conception. That is long before the brain and the nervous system are formed, and neurologists tell us that the brain does not complete its own formation until at least three years after birth. The brain is a latecomer to the anthropological landscape. And cardiac cells are the only cells that don’t divide, which means those that start beating on day twenty-one will continue to beat for your entire life. People ask where miracles are today, and to me this is astonishing! We’re talking about things so small that they can’t be seen. Where does that life come? It’s very remarkable. So the heart is also a supernatural center, because that is where the seed of the Holy Spirit is implanted within us. Where else would it go? It’s also a kind of para-natural center, because the heart is also the place where all the negative things arise from, too. To discover one’s heart is an act of reintegration, and when the heart and mind are reunited it’s an experience of tremendous spiritual joy and delight. The image that St. John Climacus uses is that it’s like a man returning home after a long journey and embracing his wife and children. We see often on the news about soldiers returning home and embracing their wives and children and it’s so tremendously powerful to see. Imagine that as an image of what takes place when all your fragmented and dispersed thoughts and wandering mind are reconnected to the deeper part of yourself. I’d like to say a few words about the breathing practices that are associated with the Jesus Prayer because I think this is one of the most misunderstood things. People sometimes warn people about this, which I don’t agree with. As we’ve said over and again, it’s not easy to free ourselves from distractions. One priest friend said we can’t even say one single Jesus Prayer without being distracted. How wretched are we? We know it’s hard to not be distracted. It’s difficult to find our center and enter the place of the heart and once we do enter it it’s very difficult to stay there because the cares of life distract us. This is why the teachers of the Jesus Prayer teach us to initially focus on the breath. If the mind focuses on the breath that means the wandering mind, which has been outside of the body, is now united to the body, and that’s a huge first step, because so often we’re absent from the present moment. You can live your whole life without actually having lived it. Focusing on the breath is important because it brings the mind back to the body, and also because the breath is the one thing that we have that is unambiguously in the present—right where and right now. If I can get my mind to focus on the breath I’m not only entering into my body but I’m also entering into the present. It is so tremendously powerful to be in the present. It can be frightening because it’s a place we’re not familiar with, and I think that’s one of the reasons we run from it. It can be overwhelming. We sense there are other things in the present too, namely the presence of God. And this reality is so big, awesome, and so mysterious that I can’t deal with it so I go back to the my own little reality—my paper I’m working on, or the party I’m planning—the smaller reality that I can control and manipulate. In so many churches there are so many activities—even doubling their talks and programs during Lent. How about just stopping? What are we running away from? 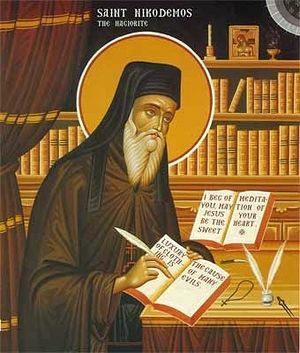 As St. Nikodemos says, breathing is respiration which involves the lungs and heart; and to follow the breath is not only to return to the body and to the present, but it’s to allow the mind to return to the place of the heart. People discourage this for different reasons, but breathing is something we do all the time; and if you’re saying the Jesus Prayer in a rhythm, to me it’s the most natural thing that this repetition will on its own very quickly unite itself to your breath. I don’t know how that can’t be. Many people will say the first half of the prayer on the inhale, and the second on the exhale, and this is what’s recommended in the Philokalia and elsewhere. While inhaling: “Lord Jesus Christ, Son of God” and while exhaling: “have mercy on me a sinner.” The prayer becomes part of people’s breathing, and sometimes you just take a breath without intending to pray, and you find yourself saying the prayer because it unites itself to your breath. This should be basic. We talked about the buried seed and the idea of actualizing the potential of the Holy Spirit, and the Jesus Prayer is precisely this cultivation. Why? 1 Cor. 12:3 says “No one can say Jesus is Lord except by the Holy Spirit.” It’s not a mantra, but the invocation of the Divine name; and like an icon, with the name comes the presence of Christ. How is the presence of Christ actualized in the world? Through the agency of the Holy Spirit, always. If Christ is present somewhere it’s due to the activity and agency of the Holy Spirit. Think about the Annunciation—the Archangel delivers the message and she asks, How can this be?” Well, simple—”The power of the Most High will overshadow you.” We say in the Creed “begotten of the Holy Spirit and the Virgin Mary.” The Second Person of the Trinity becomes a reality incarnate in her womb through the agency of the Holy Spirit. That’s how Luke begins his Gospel, and he begins the Book of Acts with the apostles gathered in Jerusalem, where Christ told them to stay, awaiting power from on high. The Spirit descends on them and transforms them from a ragtag group of blue-collar workers into the Body of Christ. We have two parallel moments in the works of Luke—the overshadowing power of the Holy Spirit that concretizes the presence of Christ, and the overshadowing at Pentecost which concretizes the mystical Body of Christ. Great musings! Thanks for sharing Father.